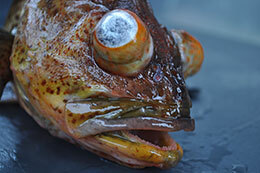 The effects of barotrauma on a rockfish. 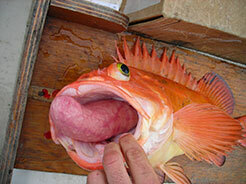 Rockfish released at depth show a remarkable ability to recover. You didn’t want it to happen and you even tried to avoid it. But there it is in front of you…a rockfish that’s probably older than your grandparents, floating on the surface with its eyes bulging and stomach protruding from its mouth. You think to yourself, “He’s a goner - game over - seagull food.” Since you’ve already reached your bag limit, you unhook the fish and let it float away. As it floats away you may feel a twinge of remorse as your bait hits the bottom, or you may cuss “the powers that be” a little for not letting you keep it. Perhaps you comment to your fishing buddy, “What a waste – its dead anyway… hey wait is that a bite?” Your thoughts quickly return to the halibut you’re trying to catch. STOP, hold the phone and stop the presses! It doesn’t have to be this way. Studies conducted on the west coast and recently by the Alaska Department of Fish and Game have shown if rockfish can quickly be returned to the depth of capture they have a very high chance of survival. The Southeast Alaska charter industry was so impressed with the results of this research they asked the Alaska Board of Fisheries to implement regulations requiring the release of non-pelagic rock fish at depth by charter anglers starting this year. Beginning in 2013 all charter vessels operating in Southeast Alaska must have a release device on board and all non-pelagic rockfish released by guided anglers must be released at depth. There must be something to this –how often do anglers ask for additional regulations upon themselves? In order to understand why release at depth increases the survival of released rockfish, it is important to know what causes rockfish to “bloat” and die on the surface upon release. In one word – barotrauma – the physical damage to body tissues caused by a difference in pressure which is also known as the “bends” in humans. Barotrauma and positive buoyancy is caused by expansion of gasses in the blood, swim bladder, and other organs when the fish is brought to the surface from the deep high pressure environment. Barotrauma injuries include crushed, displaced, or ruptured internal organs, embolisms (air bubbles in blood), exophthalmia (bulging eye), and detached retina. Often, fish are not able to return to depth by swimming if released at the surface due to increased buoyancy as a result of trapped and expanded gasses inside their body cavities. These effects can be reversed by returning fish back to the depth of their capture. A rockfish release device. A half-dozen methods can be easily used to release rockfish at depth. Research has focused on ways to reduce the effects of barotrauma by lowering the fish back to depth of capture, also known as recompression. There are a variety of inexpensive recompression devices that can be used to quickly release rockfish at the depth of capture. Recent research by the Alaska Department of Fish and Game conducted in Prince William Sound suggests survival of released yelloweye rockfish could be increased from about 20 percent to better than 95 percent by using these simple devices. You may not know what a release device is, but you probably already have one on your boat. Simply, a release device is any mechanism an angler can use to return a fish to the depth that it was captured. The practice of deep-water release is inexpensive and simple. If anglers and sport fishing guides are prepared to do it beforehand it is quick and easy to incorporate into their fishing routine. Homemade devices are as simple as a hook with its barb removed tied upside down with sufficient weight to submerge a fish - as shown in the photo. In addition to the almost limitless possibilities of homemade release devices that can be made, there are many commercial devices on the market as well. 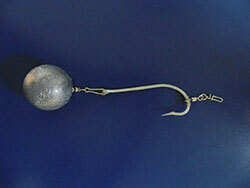 Attach a line to the hook bend and use a barbless hook is the best to facilitate release. Have the device assembled and ready to use before you start fishing. Minimizing its time at the surface increases a fish’s odds of survival. Consider dedicating an old rod and reel or downrigger for the purpose of deepwater release. A list of important rockfish conservation tools and a video that demonstrates methods of releasing non-pelagic rockfish at depth can be found on ADF&G’s website. The video showcases six deepwater release devices, both commercial and homemade, that anglers and sport fishing guides are encouraged to incorporate into their fishing routines. Avoid catching unwanted rockfish. When targeting other species, such as halibut or lingcod, rockfish bycatch can be greatly reduced by keeping jigs and bait 10-15 feet off the bottom. This has little or no effect on halibut and lingcod catch rates. Also, avoid fishing in areas with structures attractive to rockfish, such as boulders, ridges, and pinnacles. Move to a different area if you are catching rockfish unintentionally. ADF&G encourages and supports anglers and sport fishing guides to voluntarily adopt deepwater release practices in an effort to conserve Alaska’s rockfish fisheries for future generations. Please consider doing your part to prevent floaters on your next fishing adventure!